Before I found Good Shepherd, Coquitlam, I struggled with the promise I recite with the rest of the congregation during a baptism. How can I promise to support someone in their baptism when often I wouldn’t see them after that day? The answer came in the form of a challenge issued by the pastor. Rev. Ron Bjorgan asked us to produce a box to give as a gift to those being baptized at Good Shepherd. We eventually came up with yellow cedar boxes. Each box contains some books and whatever gifts the pastor deems appropriate for the person being baptized. Some of the women of the congregation also produce a stole, embroidered with the name of the person and the date of the baptism. Our pastor sometimes calls the box a gift from the woodworkers/crafters group, but it’s actually a gift from the whole congregation. One of the most important items placed in the box is a letter celebrating the baptism. All present congregational members are given opportunity to sign. Each box has a cross fixed to its top. Originally, we made the crosses from the same yellow cedar board that we make the boxes from. The idea was that all the boxes would have a common connection; just as we are all connected through Christ. However, these crosses were too fragile to stand the test of time, so we switched to oak. The body of the box is still yellow cedar, but now the cross on top is from the same oak that we use for making crosses we give to visitors and anyone else that wants one. Maybe that’s a better image anyway; the crosses on the boxes being connected with all of the Good Shepherd crosses we send out into the world. Now we have crosses on every continent except Antarctica, but that’s another story. However Ingrid’s story is one that should be told. Ingrid had a number of challenges, health-wise, as well as some emotional issues, and she never left home. She lived with her parents until they had both died. She had never been baptized. For some reason she showed up at Good Shepherd one day with questions for the pastor regarding Jesus. Ingrid had difficulties maintaining the family house and some of the folks of Good Shepherd jumped in to help clean up her garden and keep the house generally functioning properly. Eventually Ingrid asked to be baptized and we built her a box. She was baptized on April 18, 1999. Ingrid’s life was quite solitary, and I think she was very lonely, but she seemed to really enjoy coming to Good Shepherd. One day she presented us with some pictures she had drawn of the birds that came to her garden and a poem about her box (see p. 16). We only had Ingrid for a few years before Jesus took her home. One of Ingrid’s bird drawings hangs over my desk along with a kindergarten picture my daughter drew. If my house ever catches fire, I’ll be grabbing those two pictures on the way out before I consider the nearby Bateman prints. Now when I stand with the congregation and recite the liturgy for baptism, I feel somewhat better about the promise I make. 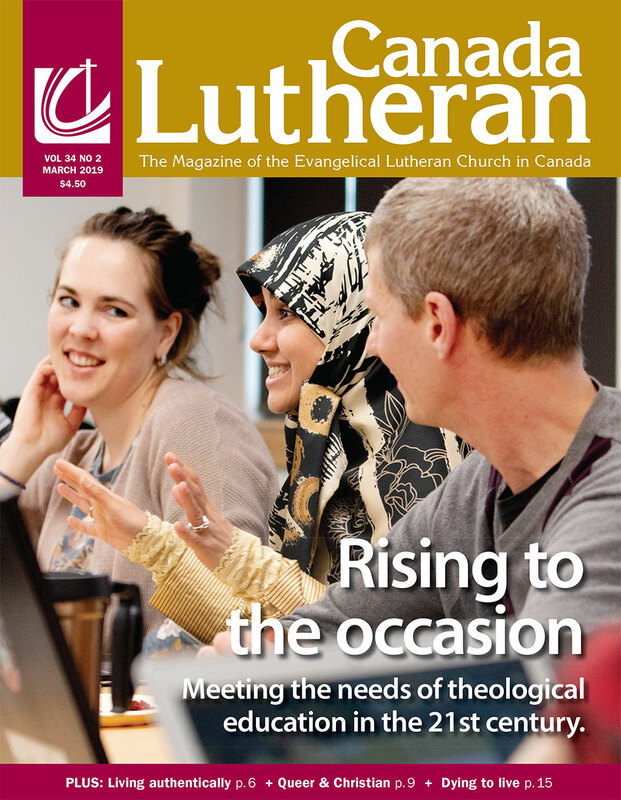 As the magazine of the Evangelical Lutheran Church in Canada, the mission of Canada Lutheran is to engage the Evangelical Lutheran Church in Canada in a dynamic dialogue in which information, inspiration and ideas are shared in a thoughtful and stimulating way. Do you ever find yourself feeling lonely?